When it comes to managing the sales process for complex, high value products and services, opportunities are the best tool in your bag. Opportunities are designed to help you track the entire sales process, including everything you are selling, the value to your company, and forecasting how each salesperson will do. This article covers the key components to building opportunities, managing them, and tracking how they are closed (won or lost). The first thing we want to be clear about is how GreenRope is different from some other CRM platforms. We do this to make your life easier and to give you more flexibility. On a personal level, I have no idea why CRM evolved this way to make things more complicated. I've always been a proponent of simple is better. In GreenRope, contacts are people. Contacts can be joined together by being in the same company, but they represent a person. Even if you sell to a company, you're still dealing with someone at that company, and your relationships are between people, not nameless, faceless entities. Opportunities are attached to contacts and/or companies, depending on how you define the opportunity. It is important to know that leads are the same thing as contacts. We do not differentiate between them. This is because a contact can be lead, and a contact may have an opportunity (or two or three) associated with him or her. We found that our users enjoy the simplicity of knowing that they don't have to convert a lead to contact and/or an opportunity. It's always easier to understand what is happening in your business when people are treated like people. Before any opportunity can be created, your sales staff must be able to judge the quality of new leads they encounter. Whether they meet new leads on their own through networking, or your marketing team hands of leads from their advertising campaigns, your sales staff must be able to identify leads that are most likely to convert. From these, the salesperson gives the lead a score of A through D, with A being the best leads. A new salesperson will need help from an experience salesperson to get good at judging lead quality. Over time intuition will help, as well. The salesperson's "gut feel" should play a role in the lead quality assessment. Setting up good demographic lead scoring rules will also help salespeople with this assessment. As you sell more, you will get a clearer picture of who your successful buyers are. Use your experience to give higher demographic lead scoring points to better qualified leads. If you find that someone with the title of "Vice President" is a good lead, give that lead demographic lead scoring points. For more information about lead scoring, read our blog post about it. Another part of the lead qualification process is identifying the source of the lead. Defining the source can be as precise as you like, but generally speaking, you want to look at major categories, such as "trade show", "networking event", "referral", or "online advertising campaign." Each opportunity you create for a potential sale is going to go through phases. These represent different stages in the sales process. Usually this starts at the initial qualification, making sure you are working with a viable lead. The subsequent phases of the buyer's journey progress toward becoming a customer. You may have several qualification steps, ensuring they are a good fit for both parties. Oftentimes with larger sale items, there will be a proposal phase, where you write and deliver a proposal to the potential client. This will be followed by a proposal evaluation phase, where you will wait for the lead to make the determination if they will choose you as a vendor. The final outcome of your opportunity will be either a "win" or a "loss". GreenRope automatically tracks progress of existing and completed opportunities for you, making it a necessary part of any B2B sales process. Not all sales processes in your business will be the same. You may sell different items that require different actions on the part of your team or the lead. For this, GreenRope provides you the ability to use "opportunity paths". Each of these represents two different paths the buyer takes on his or her journey toward becoming your customer. To make your life easy, GreenRope allows you to define as many opportunity paths as you would like. Looking at opportunity details, you will see a helpful progress arrow that visually shows you where in the sales process the opportunity is. When you use the drag-and-drop tool, the phases that don't apply to the opportunity automatically disappear, making it easier for you to visualize the sales process. Each phase of an opportunity can have checklist items associated with it. Checklists are important to ensure everyone in sales adheres to a process that works. Sometimes checklists are needed for compliance. If you have legal requirements that must be met (such as a government form that must be filled out), or if you have approval steps that muzst be granted (such as a sales manager must approve the final price you are putting in a proposal to the lead), checklists are the way to go. You can create as many checklist items as you like for each stage. When an opportunity gets to an advanced phase and there are checklist items that have not been done, the opportunity progress arrow will show red text, indicating there are unfinished tasks to be completed. GreenRope includes a helpful tool for visualizing your opportunities. This visual representation of your opportunities follows other project management tools that you may have seen in agile development or kanban boards. By dragging and dropping, you can easily track the advancement of opportunities along your customer journeys. Funnel reports are also available on both your GreenRope Dashboard and under Contacts > Opportunities. You can filter the reports however you like, making it easy to see exactly what is going on. Each opportunity has several dates that you may want to use to track that opportunity. The first, and most commonly used, is the "close date". This is the date when you should know whether or not you have won the business. Sometimes this is an estimate, as not all leads will provide a definite date when they will make a decision. Leads that have clearer definitions of what they want are likely to also have rigid schedules for their buying decisions. If your leads are evaluating different proposals, they will likely set a "proposal due date" for when they expect your completed proposal delivered to their team for evaluation. It is important to keep track of that information, especially if you have a team of people building your proposal. Last, but not least, is the fulfillment date range. This represents the dates where you will be executing on the work. If you are performing a service, or selling a subscription, this date range may be a long period of time. If you are selling a product, this may simply be a delivery date. This is helpful in understanding resource allocation to complete everything you are selling. Be sure you can fulfill what you are promising when you sell! 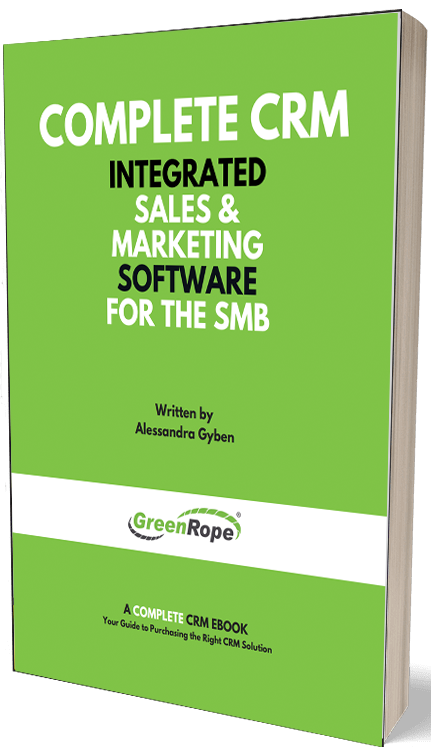 One of GreenRope's greatest strengths is our ability to automate both sales and marketing through the use of workflows and journeys. You can attach workflows to be automatically triggered when an opportunity reaches a particular phase. This could create CRM activities for a sales person or account manager, or it could trigger an automated educational email campaign, or anything else you can imagine. Workflows and journeys can be associated with opportunities, allowing you to set up automation around close dates, or waiting until a period of time before an opportunity to be closed to do something. For example, if you want to trigger an email 2 weeks before an opportunity close date to let a lead know that a deal is going to expire, you can set up a workflow or a journey "delay" that waits for that date. Everyone on your sales team must adopt a culture where everything is put into the CRM. Opportunities are no exception. The ability to learn from history, manage many simultaneous sales, and fill a larger pipeline means everyone is able to sell better. We have seen clients increase their sales funnels by over 5x from using our CRM and opportunity management tools. Remember that the ultimate goal is to have your sales team doing what they do best - manage the human aspect of your relationships. Opportunities give them deeper insight, better memory, and therefore better communication with your leads and clients. All of the sales tools described here are included with every GreenRope account. Get your whole team involved and watch your business transform. GreenRope's support team is also here to help if you have any questions, so rest assured that if you need assistance, we are here for you.